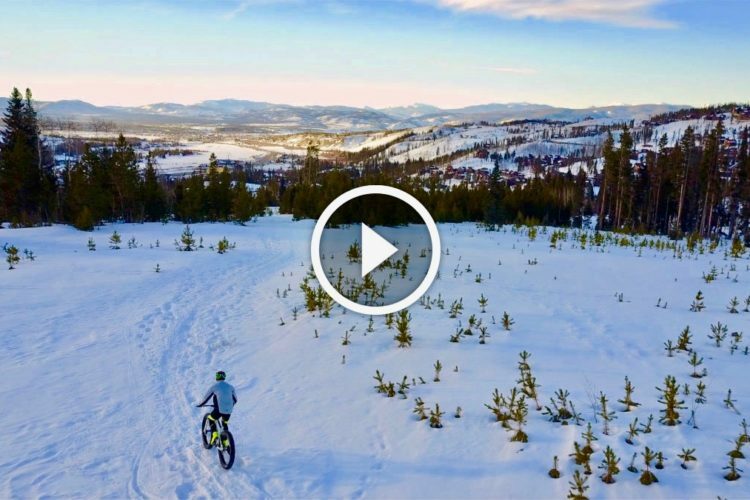 Lamere Dopamine: World’s Lightest FS Fat Bike? Two years ago I test-rode the Salsa Bucksaw full suspension fat bike, and it was honestly one of the best mountain bikes I’ve ever ridden. 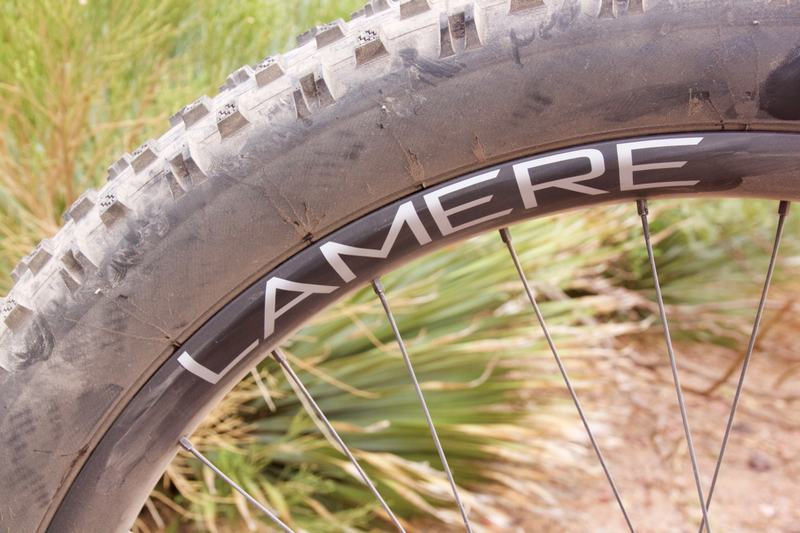 In the two years since, very few new full suspension fat bikes have been announced, so I was stoked to come across the Lamere Dopamine at Interbike this year. 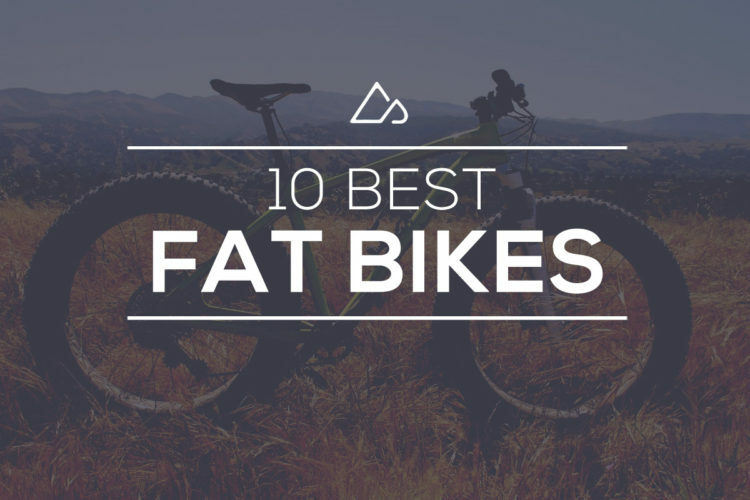 While I didn’t get a chance to test ride the Dopamine, I did get the skinny on this fattie, and here’s what I learned. 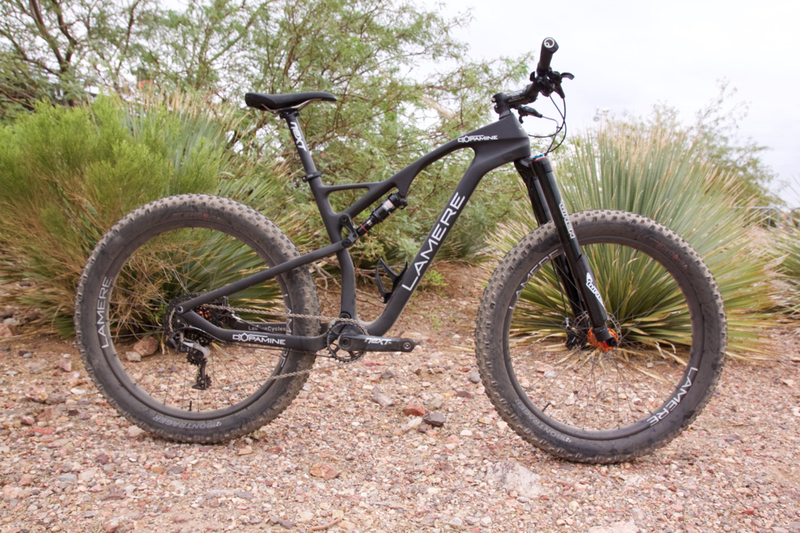 Lamere claims the Dopamine is the world’s lightest full suspension fat bike frame, and there’s a pretty good chance this is true since there is really just a couple other carbon fiber, FS fat bike frames on the market. 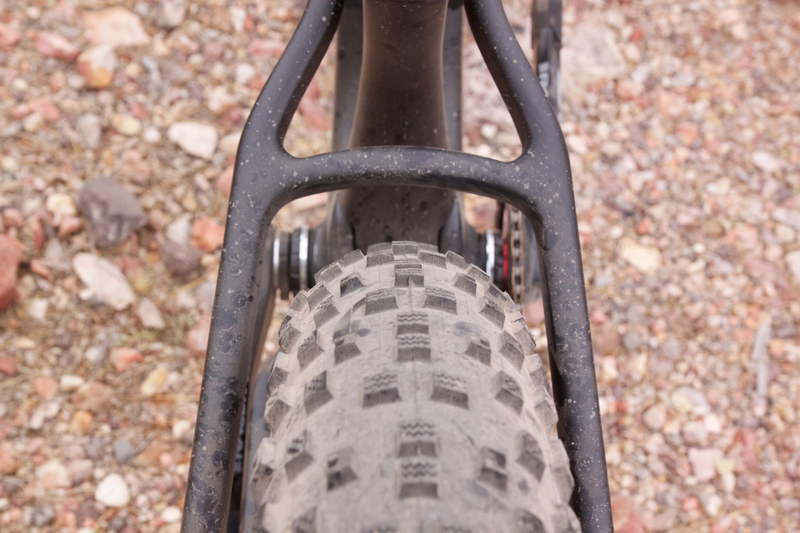 The Dopamine could also reasonably claim it offers the most rear suspension of any production fat bike, with 130mm of rear travel. 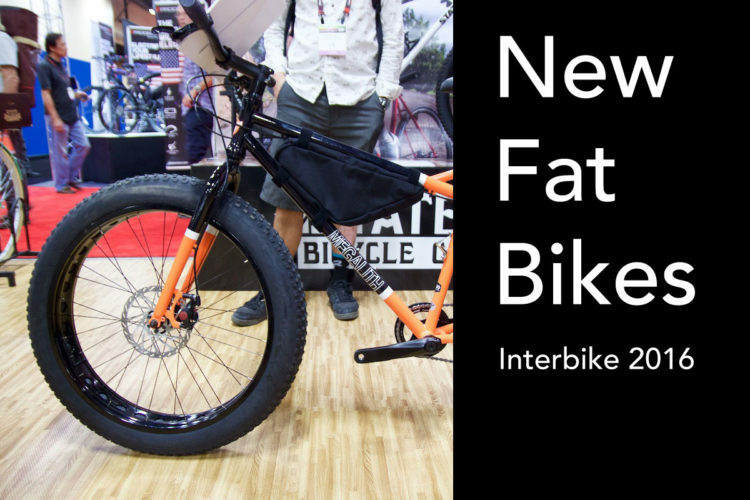 At Interbike we even saw one version built up with a 150mm Wren fork, which is a lotta suspension for a fat bike! The Dopamine can run many different wheel sizes, from 5-inch, 26er wheels all the way up to 3-inch, 29+ wheels. 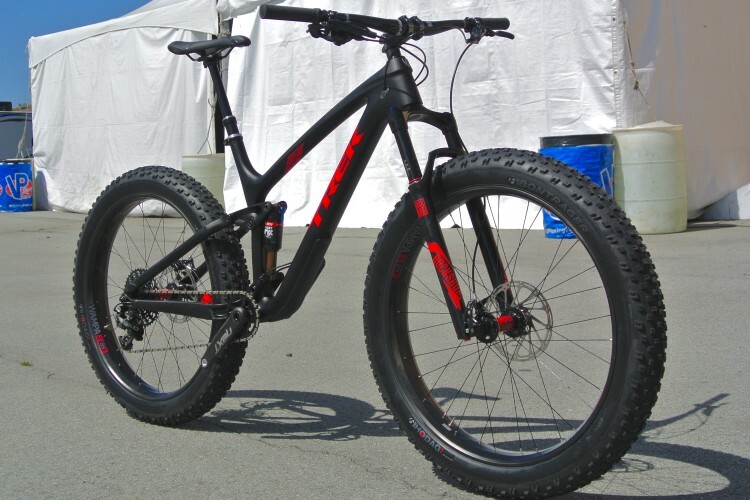 One of the bikes at the show was even running 27.5+ wheels with 3.8″ tires which, if Trek’s bet with the new Farley is correct, could be (one version of) the future of fat bikes. 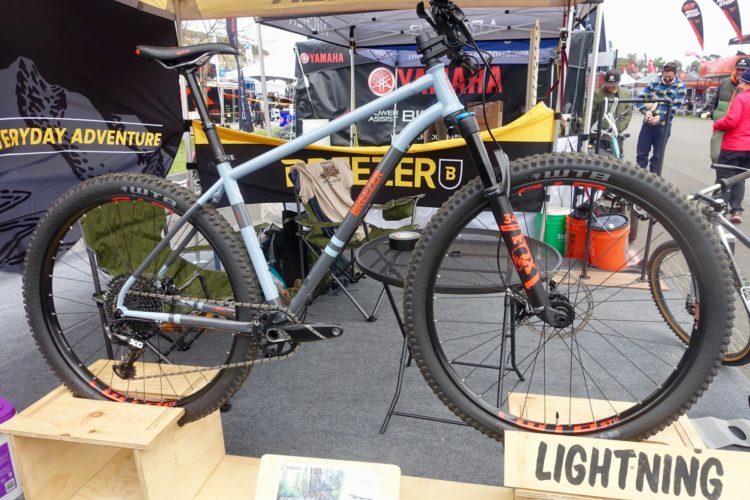 The Dopamine features a steep 69.5-degree head tube angle, which the company says is intended to give the bike quicker steering and better pedaling performance. 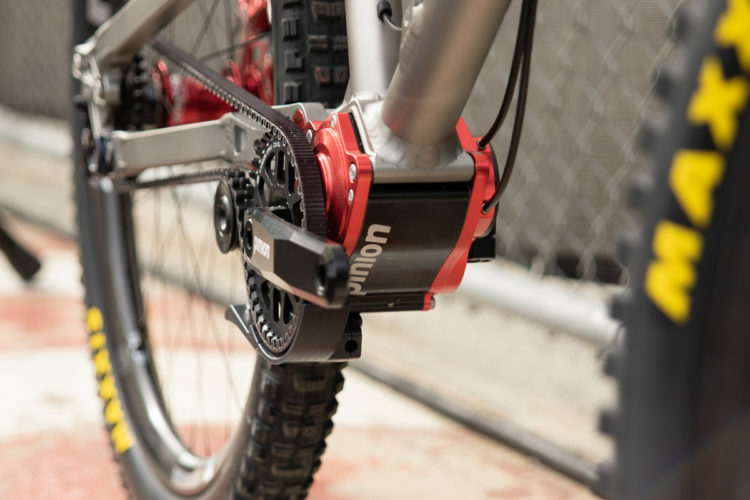 In fact, many owners are using the Dopamine as a fat race bike thanks to its ability to run fat bike legal, 3.8-inch 27.5 tires. 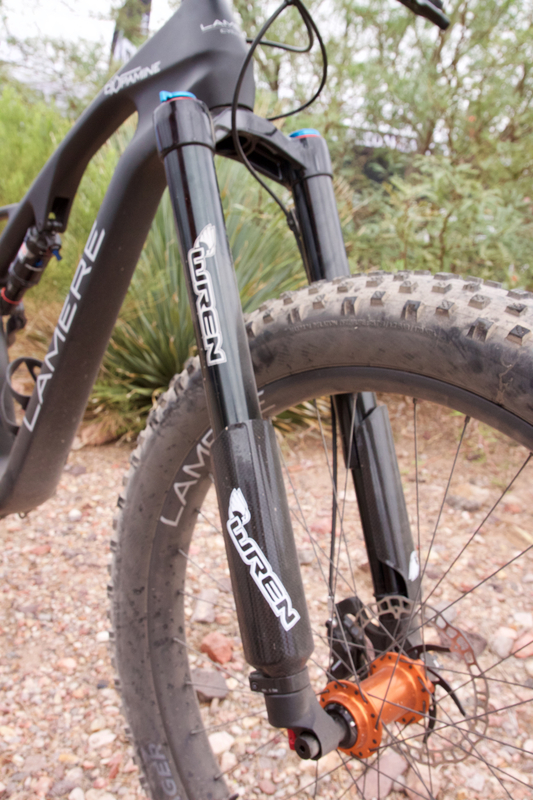 Lamere says a complete bike built up with XT components, fat wheels, and a RockShox Bluto fork weighs just 25.81 pounds, which is incredibly light for any FS bike, let alone a fat bike. That build will set you back $5,900, while the frame can be had by itself for $2,200. An X01 build is $6,500 and should weigh about half a pound less than the XT build. Lamere offers a number of other bikes, though many of these are “open mold,” meaning the frame designs are not unique to Lamere. 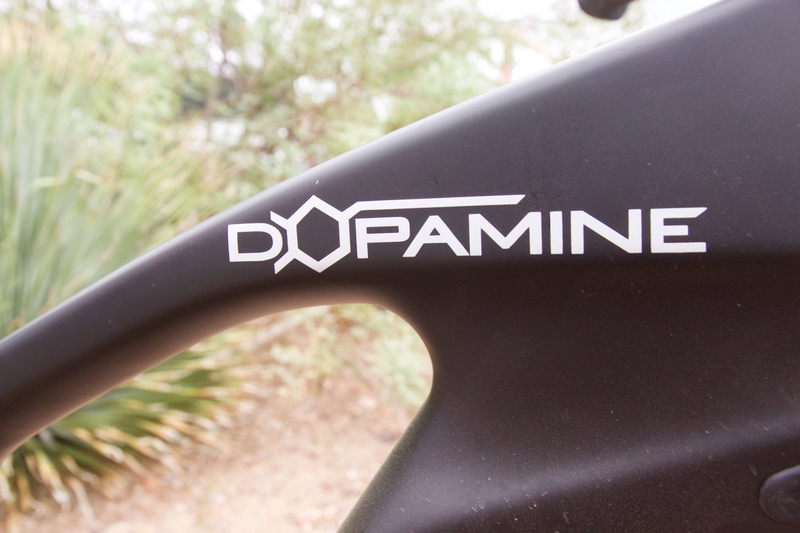 However, the Dopamine is a custom design, so Lamere is the only company selling this bike. Check out the Lamere website to learn more about the Dopamine or to buy directly from the company.